Ancient Babylonian tablets like this one show that calculating the distance Jupiter travels in the sky over time can be done by finding the area of a trapezoid, showing the creators understood a concept essential to modern calculus — 1500 years earlier than historians have ever seen. A set of ancient Babylonian tablets that describe how to track Jupiter across the sky have revealed an astronomical technique 1,500 years ahead of its time. Jupiter's erratic pace across the sky — appearing to slow down and speed up from day to day based on the combination of its orbit and Earth's — must have perplexed ancient astronomers and tested their best computational techniques. The new results were detailed in the journal Science today (Jan. 28). The connections between speed, position and time are known to most modern travelers — people easily understand speed as a measure of miles or kilometers per hour. Locations are often described in terms of time ("it's only an hour away") rather than distance. The insight that led to calculus demonstrated the connection between a graph of the traveler's changing speed and the total distance traveled. "This is familiar to any student of physics, or math or science," Mathieu Ossendrijver, an astroarchaeologist at Humboldt University of Berlin, told Space.com. But using time as a variable to calculate speed or distance has not been part of human culture forever. Using a graph to understand motion or speed over time is usually traced back to scholars in Oxford and Paris around 1350, and then to Isaac Newton, who developed integral calculus, Ossendrijver said. "What I now found is that this method was already invented in Babylonia more than 1,500 years earlier." Ossendrijver was an astrophysicist before he began studying the history of science and cuneiform in 2005. In 2012, he published a book of new translations for the known Babylonian tablets that featured astronomical calculations and tables. The procedure Ossendrijver translated from the Babylonian tablets appears to show how to calculate the distance that Jupiter has traveled over a long stretch of time, by using measurements of how fast it was moving across the sky on given days. This calculation might be particularly interesting to the ancient astronomers because of Jupiter's association with Babylon's patron god, Marduk. Under the Babylonians' earlier, arithmetic-based method, astronomers would measure the distance Jupiter traveled every day — then, by adding together the "distance per day" for each day from the first through the 60th, they would get the total distance traveled. The newly discovered method instead used a geometric shortcut, and only needed the "distance per day" for the first day and the 60th, not the ones in between, to get the distance overall. Today, that calculation might be done by drawing points on a graph for Jupiter's measured speed on the first day and on the 60th day. Each of those points shows Jupiter's speed across the sky and the day the speed was measured. Drawing lines to connect the points to each other and to the "ground" directly below them, at a speed of zero, creates a geometric shape — a trapezoid — and calculating that shape's area reveals how far the object traveled. The process of measuring that geometric shape was described on the Babylonian tablets. Although the tablets did not have any visible graphs, the calculations done matched this technique precisely, Ossendrijver said. The distance travelled by Jupiter after 60 days, 10º45', is computed as the area of the trapezoid whose top left corner is Jupiter's velocity over the course of the first day, in distance per day, and its top right corner is Jupiter's velocity on the 60th day. In a second calculation, the trapezoid is divided into two smaller ones with equal area to find the time in which Jupiter covers half this distance. When Ossendrijver first encountered the Babylonian tablets, he didn't understand why calculations on a trapezoid were included along with tables related to Jupiter's position, he said. Only after he saw a fifth, uncataloged tablet, which showed a different procedure for finding Jupiter's position using the same examples as the trapezoids, did he realize the connection between the figure and the tables, Ossendrijver said. Eventually, he understood a second trapezoid calculation on the tablets, too: dividing it into two trapezoids with equal area, which would correspond to finding when Jupiter had traveled half the distance, he said. The advanced technique has been found only on the four tablets so far, which all use slightly different wording but the same example, he said. There isn't any evidence yet of the process being more widespread, Ossendrijver said. "This would open up new ways of computing motion they could have applied to other planets, other parts of Jupiter's motion," Ossendrijver said. "We don't have [examples of that]. We only have these four tablets, and they all deal with Jupiter — and they all deal with the same segment of 60 days. That's quite strange." When Babylonian culture, and the cuneiform script it was recorded in, died out around the year 100, the technique was seemingly forgotten, Ossendrijver said, only to crop up again in the 14th century when scientists and mathematicians began to use graphs to calculate changes to a system over time. Other aspects of Babylonian astronomy, in contrast, made it through the ages: People still discuss signs of the Zodiac, for instance, and use the Babylonian system of degrees, minutes and seconds, in units of 60, to calculate distances across the sky. Babylonian observations and techniques, translated into Greek, offer evidence of that transfer of information, Ossendrijver said. 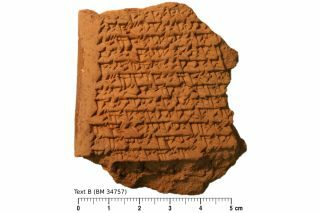 Knowing that ancient Babylonians had access to this newfound technique provides a whole new context for examining previously discovered tablets, as many tablets that are already translated have sections that aren't yet understood, Ossendrijver said. And it also forces science historians to rethink the way astronomical techniques evolved, he said. "In the beginning, I felt insecure myself, because the implications of this, from a history of science point of view, are kind of — big," Ossendrijver said. The process shows "a more abstract and profound conception of a geometrical object in which one dimension represents time," Alexander Jones, a historian at New York University said in Science's news article accompanying the work. It's much earlier than these concepts have ever been found before, he said, and "their presence … testifies to the revolutionary brilliance of the unknown Mesopotamian scholars who constructed Babylonian mathematical astronomy."